Sometimes, you rent movies from iTunes Store, but you can play them on only one device. Do you want to play them on your own mobile players? If you want to, you need to remove the DRM protection. Because the DRM - protected prevent the rental M4V video playing everywhere. 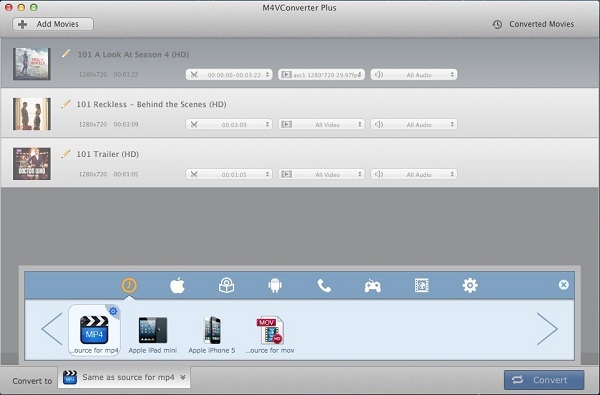 M4V Converter Plus is a universal iTunes M4V rental converter software. 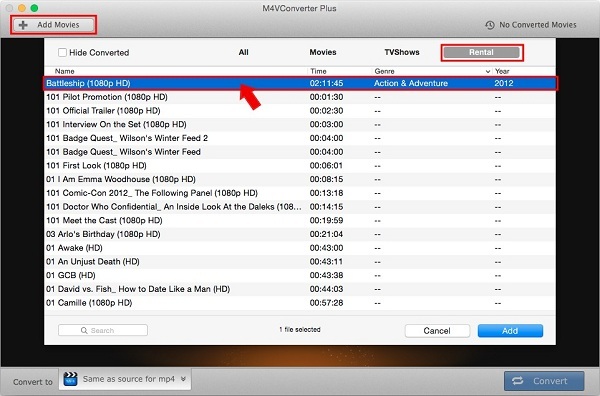 It can remove the DRM of iTunes M4V rental or purchased video from iTunes. Convert DRM protection movies to unprotected MP4, MOV or other popular formats. You can use it remove iTunes DRM and convert your iTunes purchased or rented movies to your need format. This M4V rental converter is easy to use. It is designed for all the users, even if you are a fresh Mac user. You can convert M4V to unprotected movies simply. Now I would like to show the detailed steps on how to convert M4V to MP4 format. Step 1: Download and run the iTunes M4V rentals to MP4 converter. First you need to download and install M4V Converter Plus. Launch it. Step 2: Add M4V rented files to the software. Add M4V files you want to convert by hitting the button "Add Movies". Choose the M4V video files you rented from the iTunes Store. Then click "Add". Step 3: Set MP4 as output format. From format profile, select "Same as source for mp4" as output format. Step 4: Start M4V rentals to MP4 conversion. Click "Convert" to start the conversion. Few seconds later, you can see the MP4 video converted on your Mac. OK, we have finished the whole conversion of rented M4V to MP4, Apart from convert M4V to MP4, you can use it to convert M4V movie rentals to other format files, such as MOV, FLV, AVI or audio format. Now, Just Free download and enjoy it.